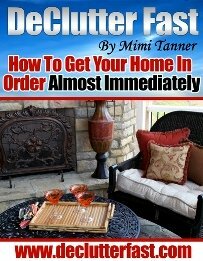 Organizing your home is an ongoing process. 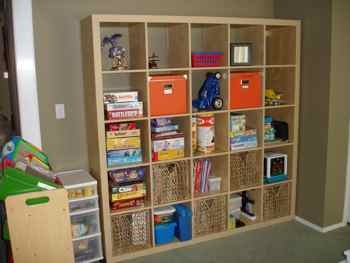 I’ve recently updated my living room storage with an Ikea wall unit. Things keep changing and I keep re-organizing to keep up. This area of the living room is deemed the playroom and there are quite a few toys on this wall. The current system worked well enough for us. However, we’ve always thought about putting up a wall unit here to make better use of the wall space. 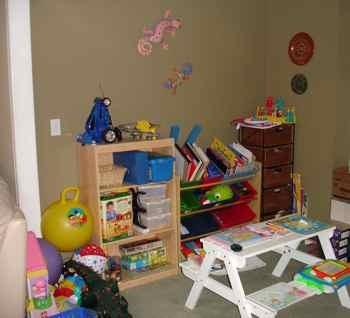 Here is the playroom storage before. 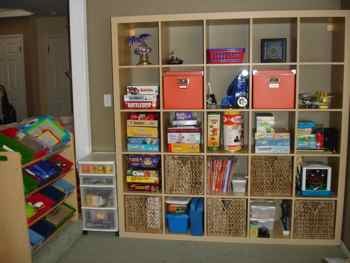 We had toy bins and a book shelf that held quite a few toys along with the wicker baskets that hold some grown-up stuff. This picnic table never made it outside. Instead, we use it inside as a place for the kids to work and play, as well as a place for kids to sit when we host a party. We went to Ikea to look for a dresser and nightstand for my daughter’s room. But while we were there, we took a good look at this wall unit we’ve considered. It’s 72 x 72 inches square and has 25 cubbies to hold and organize a lot of belongings! And, best part is that it only cost $199. (We paid extra for the baskets and boxes to go on it, about $15 per basket and $10 for the two orange boxes.) Still, an awesome deal for the end result. I managed to put most of the kids toys you see in the before picture on that wall unit. I also took a large supply of board games from a shelf on the other side of the room and moved them onto the wall unity as well. And yet, some of the baskets and the boxes are still empty. There is still plenty of room to grow as things continue to change. We did opt to keep the toy bins for now. The baskets in the living room storage unit are quite large, and the bins help to sort and organize the smaller toys we still have. We’re very pleased with our new living room storage unit. I believe it can continue to change with us over the years to come.